Umpqua Community College Enabled Chris Harper Mercer’s Massacre! Our 2nd Amendment rights are not up for debate. Reality continues to confirm this each time the left starts dancing on the graves of victims of a violent shooter. We the People have grown weary of the constant clamor to curtail our rights, so the grave dancing continues to backfire on the left. Mass shootings are incredibly rare when measured on a per capita basis against a U.S. population of 320 million, but with that many people they are inevitable. With each mass shooting the left’s grave dancing starts sooner, long before any actual information about the event comes out. Social media quickly spreads news of the occurrence of a shooting, but doesn’t speed up the time it takes for law enforcement to decide to release the details. With absolutely nothing to go on but his disdain for the Constitution, Obama immediately attacked the 2nd Amendment in the wake of the Umpqua Community College shooting in Oregon. Obama showed no true concern for the victims or for the American People as a whole. In fact, he showed hatred for the American people by making it very clear that he blamed the NRA and he would go after the 99.999999% of Americans who did not shoot anyone at Umpqua Community College and make it political, his agenda being against our natural right to bear arms. The kind of rhetoric he used is precisely why gun sales keep going up and the anti-gun movement continues its pattern of failure. The shooter, who we later found out was Chris Harper Mercer, was the only person who wasn’t stopped from carrying guns by the “No Guns Allowed” sign. Everyone else in the school valued the sign more than their own lives. Mercer was certainly the bad guy, but he didn’t make his crime possible. Umpqua Community College made the shooting easy for Mercer by denying a core American right from the students and faculty of the school. The families of the victims should immediate ban together to sue the school for its role in the massacre. This would send a clear message to other schools, businesses and institutions, that if you deny the people their God given right to defend themselves, then you are 100% responsible for guaranteeing their safety and held culpable and responsible if you fail. The first bit of detail that most of us saw regarding Mercer’s shooting was that he asked people if they were Christian. Then he shot the Christians in their heads, killing them and shot everyone else in the legs. Everything else being talked about was pure speculation. Information about Chris Harper Mercer seems to trickle in slowly. At first, many liberals were quick to jump on the fact that Mercer’s MySpace page claimed that he was a Conservative Republican. Absolutely nothing about his social media fingerprint even suggested he knew want conservatism in America is. Liberals must think that it’s impossible for a mass murderer to lie on MySpace. The same page said he kills zombies and eats brains. His profile also said that he was non-religious, but spiritual. For those of us who think logically, targeting Christians doesn’t seem to correlate with a non-religious spiritual person. It’s not as if there is a jihad against Christianity among growing sects of budding, young Agnostic Buddhists. As a matter of fact, further information came to light that he had sympathies for the Irish IRA terrorist organization and his MySpace friend Mahmoud Ali Ehsani appeared to be an islamic terrorist sympathizer. Even days later, we still don’t know all of the details. There are surprisingly few facts that we have to go on with regard to Chris Harper Mercer. We’ve seen claims that he was part of Black Lives Matter and there have been doctored photos of him to make his skin look whiter, to emphasize the media narrative that he is white. It has been claimed that he is not white, or that he is black or mulatto. There is at least one report that he is on the Russian terrorist watch list and that Russia has passed on this information to the U.S., but that the Obama Administration has ignored it. ISIS actually claims that his actions were under their direction. Now it is said that Mercer is British born. With as little as we know about Chris Harper Mercer, some conclusions are obvious. He was anything but a Conservative Republican. It was Mercer, not the NRA, and not any other law abiding, gun owning American who shot the victims in the school. We know that Mercer’s dad was shocked and surprised that this could have happened, as is the case with all similar shootings when it comes to the friends and family of the shooter. We know that every one of his victims wished they had a gun. We know that a gun free zone isn’t a very safe place to be. There is little choice for rational people, but to wait until more facts come in before jumping to crazy conclusions such as this being a false flag shooting that was pulled off by actors just to push the anti-gun agenda. Whether an incident is real or fake, the reaction of the left is always the same: attack the 2nd Amendment. They salivate while waiting months on end for another ultra rare mass shooting to occur, so they can immediately hit the air waves and social media with the same, tired, old talking points, which blame you and I. They want more and more gun control, but can never name a single new law, which could have prevented any shooting. The left’s incapability to justify new laws doesn’t stop them from wanting them, because public safety isn’t the reason the left wants gun control. The left loves mass shootings. They aren’t concerned about the victims; they can’t wait for the next group of victims. In fact, it’s conservatives who give more to charities of the victims. Gun control is not sought to stop people from shooting one another. The real goal is government control. The corrupt and lawless government we have today does not like the idea of an armed populous any more than Hitler, Stalin, or Mao did. Disarming the people is an absolute prerequisite to full government control. Sure, some of the brainwashed rubes, who the left uses to spread their lies and talking points, might think they have good intentions, but they are pawns. They mindlessly push forward on their march. The people who know the real reason that gun control is sought are the ones in power who want to control us. The rooks, knights, bishops, kings, and queens are all in government or in some position to benefit from a tyrannical government. There are two undeniable truths about gun control in the last 7 years. First, gun control activists have come out in record numbers and pushed harder than they ever have to infringe on our 2nd Amendment rights. They have spent more to combat the 2nd Amendment than ever before. Moms Demand Action for Gun Sense blew through 50 million dollars in an anti-gun campaign that resulted in nothing but complete and utter failure. Second, patriotic Americans who value our rights, especially the 2nd Amendment have been winning at record rates. New gun control bills have been defeated and existing laws have been repealed. Several states including Texas and Missouri have legalized open carry and some states including Missouri have restored the right to bear arms to teachers. Washington D.C., California, and even Illinois have been forced to recognize the right to bear arms by repealing laws outlawing it or issuing concealed carry permits. The zealotry with which the left has attacked the 2nd Amendment has cost them dearly. They exposed how venomous they are. They weren’t careful enough to brainwash all of their rubes with the right talking points and many let the cat out of the bag in social media that their end game is to disarm everyone. We the People could clearly see that if we gave an inch, we’d lose a mile. Our rights are no longer up for a debate. When the rabid gun grabbers start dancing on another grave and throwing fits, just point at them and chuckle. A shooting is tragic and should be talked about, yet when a shooting happens, the left’s topic of conversation turns from the shooting to their hatred of America and our rights. Had the victims in Umpqua Community College not been stripped of their rights, the results could have been far less tragic. Mass shootings are stopped by armed civilians all the time. We don’t hear about these, because they don’t become mass shootings if they’re stopped by a bystander and these stories counter the leftist agenda. You have the right to bear arms. You have the right to protect yourself. Don’t let a sign on a door stop you from exercising your rights! No one in a gun free zone will protect you. You are always responsible for your own protection. 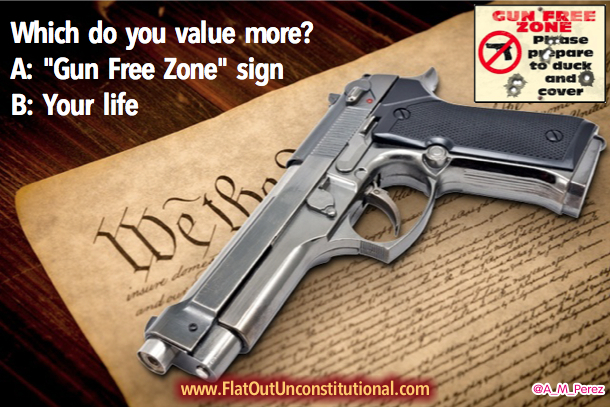 Is your life worth complying with a Gun Free Zone sign? I want to repeat one point and be very clear about it. I want to see the families of Mercer’s victims sue the living daylights out of Umpqua Community College. The NRA should be leading and funding this lawsuit. This is what we pay dues to the NRA for. If a college revokes your rights, they must pay the price for it. Demand it! Next Alert! U.N. Military Invading America with Obama’s Blessing! According to eyewitness reports, the Oregon shooter asked students what their religion was, and if they said “Christian,” he shot them in the head. Yet the secular media, for the most part, is focusing more on gun laws than on the shooter’s alleged anti-Christian motivation. Do you have any credible photos of the gun free sign? I’ve also read several posts that said the campus allowed guns with permits and also there were people armed that day on campus. It’s in their campus policy. The law overrides it, but how many stooges in college do you think know the law. The students were disarmed, because the college said they had to be. There was one guy who was apparently armed on the other side of the campus. An Air Force Vet on campus with a concealed carry permit was told to stand down when he offered to help during the shooting. Agree! Everyone seems to hop on the “Mental Illness” and “Law-Abiding” narratives immediately after these events. This idiot was so “Mentally Ill” that he picked a juicy, ripe “Gun Free Zone” and “illegally” carried weapons on the grounds to do his bidding. The real solution, if we care about humanity, is to arm everyone the way the Constitution enables People to do. Also, something worthy of discussion is the fact that a Gun Education Academy turned this guy away. They felt something was amiss. This happened with those 2 idiots at the Bundy Incident. In fact, those 2 folk who shot the cops were turned away by the Militias. It seems to me that “Responsible Gun Owners” smell the rat poison in these lone idiots far sooner than families do. As a side note; Those 2 that shot the cop at the Home Depot, were from right here in Finley, WA. Having lived here my entire life, I got some street intel on them. Interestingly, they couldn’t even get along with their Drug Dealers.